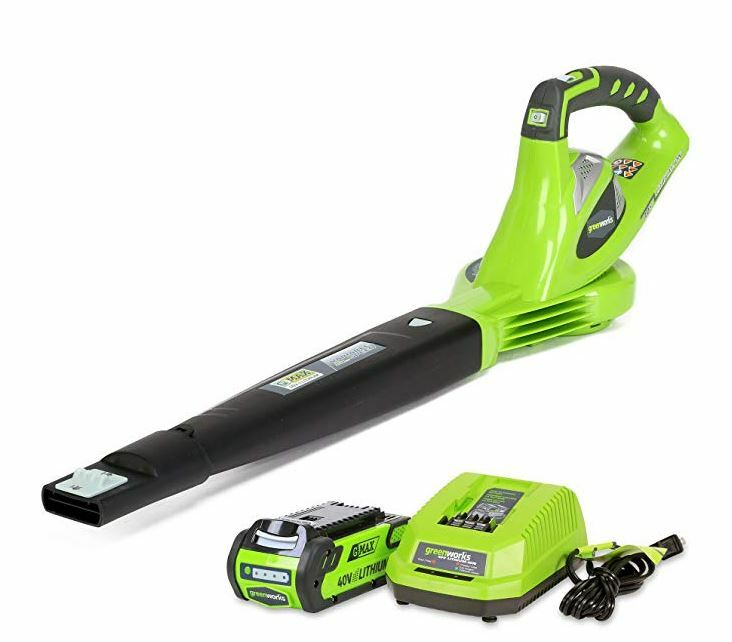 Deal of the Day: Save on 31% Greenworks 40V Cordless Leaf Blower for 10/11/2018 only! With Deal: $89.21 & FREE Shipping. Green Works is starting a revolution in outdoor power equipment starting with its Green Works Pro 80V and 40V Li-Ion MAX system. Combined with our DigiPro Brushless motor, this is the highest voltage, gas equivalent, commercial grade cordless outdoor power tool system in the industry. Featuring the simple electric start, light weight designs and quieter motor, professionals and heavy DIY’ers can now tackle tough jobs through variable terrain without the hassle of gas, fumes, heavy gear or delicate maintenance needs of gas powered engines. The evolution of Green Works lithium-ion technology and designs have made it possible for professionals to get their jobs done by simply snapping in a battery and pressing a button while delivering high performance power and longer run time to get the job done. Green Works Pro 80V Li-Ion MAX System features a Jet Blower, 18-inch Chainsaw, Hedge Trimmer, String Trimmer, Lawn Mower. The 40V Jet Blower features a high speed brushless motor that delivers 115 MPH and 430 CFM making clearing leaves a breeze. Light weight and easy to use, with a variable speed trigger and cruise control for optimized control.With Green Works, we understand that it’s not just a tool.it’s your life. Deal of the Day: Save 35% on Greenworks 40V Mower for 7/27/2017 only! This double-duty machine delivers great service. The Greenworks dual blade lawn Mower’s 40v, 4ah lithium ion battery gives it a run time up to 60 minutes with more power for the toughest lawns. Innovative high-speed twin 10 inch blades let you finish your work faster with a 20 inch total cutting width and excellent mulching ability. Single-lever 5-position height adjustment between 1 ¼ inch and 3 1/8 inch lets you choose the best cut for your yard. This mower’s lightweight poly deck is extremely durable and easy to push through any yard, while the 10 inch rear and 7 inch front wheels allow maximum maneuverability. Rear bag and mulch functions convert easily without tools. Also available: li-ion 40v 4.0 ah battery, item 32911. Automatic battery switch-over pulls power from the second battery once the first is depleted to eliminate downtime. Deal of the Day: $259.18 & FREE Shipping. Amazon deal of the day for 4/24/2014 only! Today only, save on the 40-volt lithium-ion-powered G-MAX lawn mowers from GreenWorks. A great alternative to gas-powered tools, the lightweight G-MAX line makes yardwork easier without sacrificing power. Today only, save up to 30% on the 16-, 19-, or 20-inch 40-volt lithium-ion-powered G-MAX lawn mowers from GreenWorks. This one-day offer is valid on April 24, 2014, while supplies last. Discount is already included in the current Amazon.com price. Applies only to products shipped and sold by Amazon.com and does not apply to products purchased from third-party merchants on the Amazon.com website. The lawn mowers include a 40-volt lithium-ion battery compatible with all GreenWorks G-MAX outdoor power tools. With up to 70 minutes of runtime, G-MAX lawn mowers are a great alternative to gas-powered mowers.